کنیا یاٛ گئل ڤولاتٱ کاٛ ها د ٱفتۉزٱنۊن هومپیڤٱند آفریقا. پاتٱخت ای ڤولات شٱر نایرۊبی ٱ. ↑ ۱٫۰ ۱٫۱ Constitution (2009) Art. 7 [National, official and other languages] "(1) The national language of the Republic is Kiswahili. (2) The official languages of the Republic are Kiswahili and English. (3) The State shall–-–- (a) promote and protect the diversity of language of the people of Kenya; and (b) promote the development and use of indigenous languages, Kenyan Sign language, Braille and other communication formats and technologies accessible to persons with disabilities." ↑ countrymeters.info. "Kenya population 2017 – Current population of Kenya". http://countrymeters.info/en/Kenya. ↑ "Kenya 2009 Population and housing census highlights". Archived from the original on 10 August 2013. https://web.archive.org/web/20130810182358/http://www.knbs.or.ke/Census%20Results/KNBS%20Brochure.pdf. Retrieved 22 May 2011. . http://www.knbs.or.ke. 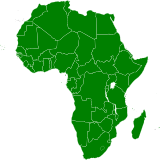 ↑ ۴٫۰ ۴٫۱ ۴٫۲ ۴٫۳ "Report for Selected Countries and Subjects (valuation of Kenya GDP)". International Monetary Fund. http://www.imf.org/external/pubs/ft/weo/2017/02/weodata/weorept.aspx?pr.x=63&pr.y=1&sy=2015&ey=2022&scsm=1&ssd=1&sort=country&ds=.&br=1&c=664&s=NGDPD%2CPPPGDP%2CNGDPDPC%2CPPPPC&grp=0&a=. د نۊ زنٱ بیٱ د"https://lrc.wikipedia.org/w/index.php?title=کنیا&oldid=90068"
اؽ بٱلگٱ ایسنؽا آلشت بیٱ د ‏۸ ماٛی ۲۰۱۸، د ‏۱۲:۴۷.